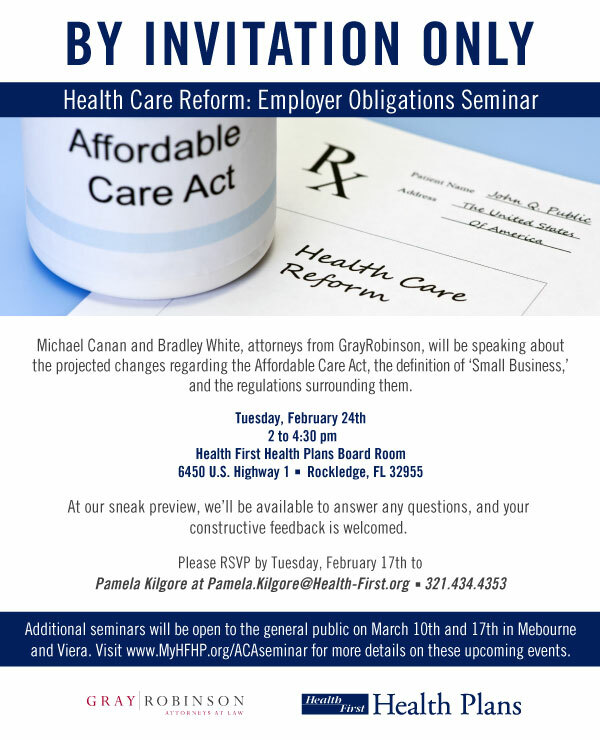 ORLANDO, FL – February 17, 2015 – Michael J. Canan, shareholder in GrayRobinson’s Orlando office, and Bradley F. White, senior associate in GrayRobinson’s Melbourne office, will speak at the “Health Care Reform: Employer Obligations Seminar” on February 24, 2015. The seminar is hosted by Health First Health Plans and will discuss projected changes to the Affordable Care Act. For more information, click here. Canan has done considerable work with employers with regard to health plans under ObamaCare, and has written a book on this subject titled “Understanding Healthcare and the Affordable Care Act.” His experience and practice includes all phases of qualified retirement plan work, with special emphasis on the establishment and continued maintenance of ESOPs; plan design, including cross-testing, defined benefit plans, and 401(k) and (m) features; controlled group and affiliated service group issues; IRS and DOL administrative problem resolution; and nonqualified deferred compensation. Canan received his undergraduate degree from Stanford University, his Juris Doctor from Berkeley Law at the University of California, and a master’s degree in taxation from New York University. White, attorney and Certified Public Accountant, received his undergraduate degree and Juris Doctor from Florida State University and his master's in accounting from the University of Central Florida. His experience includes helping clients with mergers and acquisitions, entity formation and dissolution, corporate reorganizations, entity conversions, capital financing, tax planning, asset protection, software licensing and development, commercial lease agreements and management and employment agreements, as well as representing clients before the IRS.